The guides in this series by Tom Wright can be used on their own or alongside his New Testament for Everyone commentaries. 1 & 2 Timothy and Titus could be called the Teacher s Manual because these letters contain so much advice about the kind of teaching Christian leaders should and shouldn t be giving. Just as Timothy and Titus needed help to lead their young churches in the midst of powerful cultural forces, we need guidance for leading and living well in our own context. These studies of 1 & 2 Timothy and Titus point us in the right direction. They bring us to a greater understanding of ourselves and show us the way through the challenges we face. 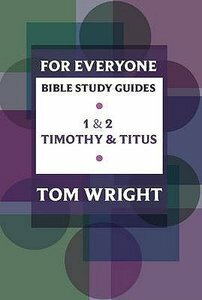 About "1 & 2 Timothy and Titus (N.t Wright For Everyone Bible Study Guide Series)"